TAG Heuer makes measuring a hundredth of a second fractionally more affordable with the Mikrograph Anniversary Edition. Back in 2011 the original Mikrograph in rose gold made its debut for US$50,000. It could measure 1/100th of a second, thanks to a clever movement with twin balance wheels, one running at 360,000 beats per hour, or 100 beats per second. Those were optimistic and heady days, the same year TAG Heuer introduced the US$120,000 Mikrotimer 1/1000th of a second chronograph. As the resolution of the chronograph got fractionally smaller, prices grew exponentially. The final, mad burst extravagance came in 2014 when the Mikropendulum Tourbillon was announced in 2014 – priced at over US$400,000. The Mikropendulum Tourbillon never made it to market, naturally. Now the Carrera Mikrograph Anniversary Edition – powered by the same 480-part movement as the $50,000 original – carries a price tag of US$21,000. One factor in the reduced price is the case, which is now stainless steel. Still large at 45mm in diameter, the watch case is “bullhead” style, meaning the crown and pushers are on top. 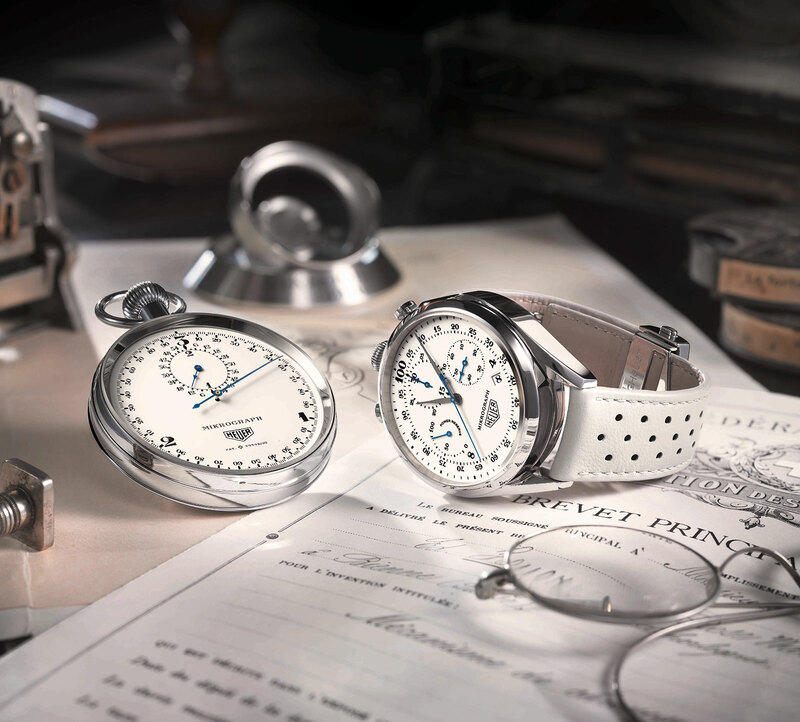 The dial is white lacquer and modelled on 1920s sports stopwatches made by Heuer. The case is actually two part: a lower cradle attached to the strap and a separate module containing the movement. The module locks into the lower case like a bayonet (twist and remove); it be removed and fixed onto a table clock stand or instrument holder (that is meant to be screwed into a car dashboard). 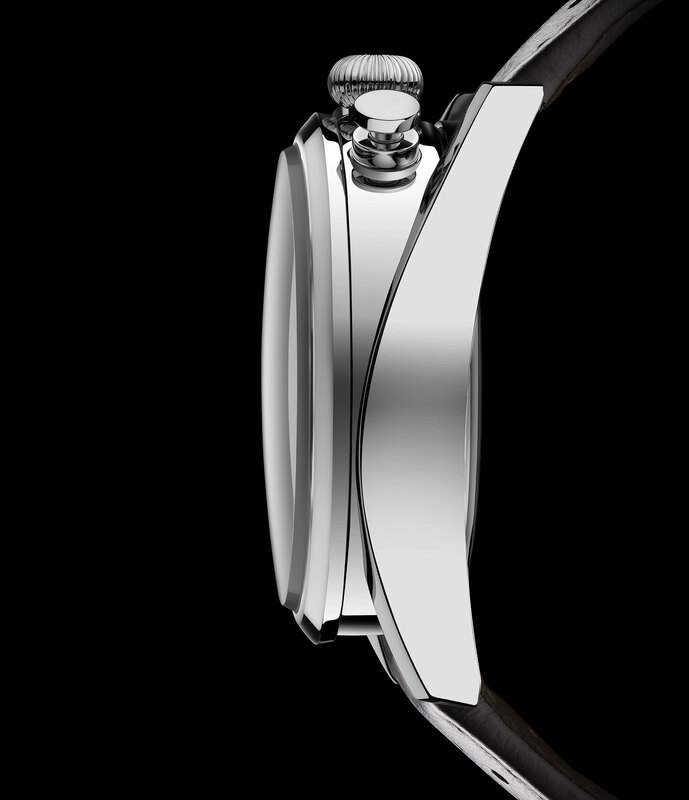 The size of the watch is a consequence of the movement, which is a large but marvellous creation. It’s essentially two movements in one. One half of the movement is the regular time telling portion with its own barrel and escapement, which has a 42-hour power reserve. Way more interesting is the other half that comprises its own mainspring and escapement, completely independent with a balance that runs at 360,000 bph. At full tilt this 1/100th of a second mechanism runs for 90 minutes. Both sides of the movement are wound by the same rotor that winds bidirectionally, with each direction winding one barrel. 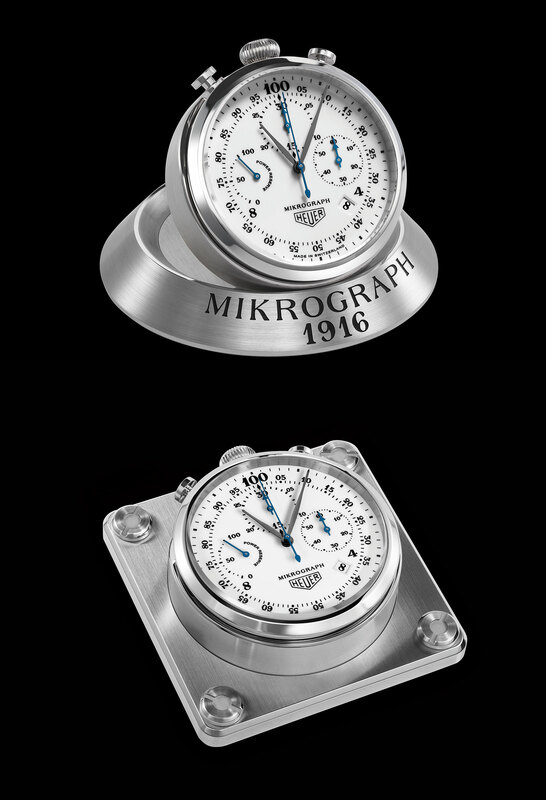 The Carrera Mikrograph Anniversary Edition (ref. 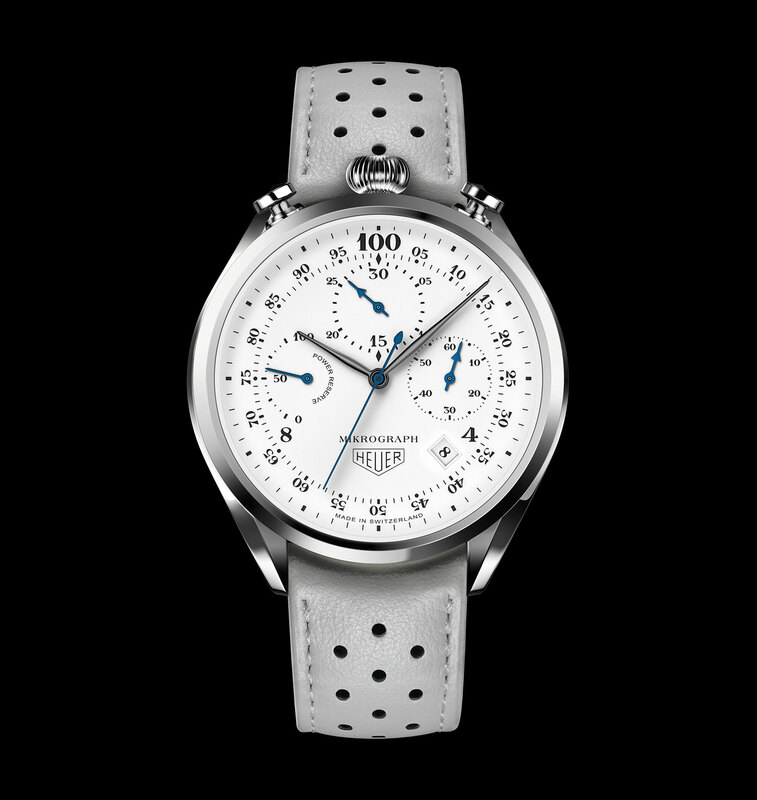 CAR5A1A.FC6374) is a limited edition of 100 watches, priced at US$21,000. Like last year’s more affordable belt-driven Monaco V4 Phantom, the new Mikrograph feels like the curtain call for TAG Heuer’s ultra high-end timepieces, the likes of which won’t be seen for a long time to come. TAG Heuer will conduct a public vote for fans and collectors to choose the next Autavia chronograph from a selection of historical models.